I recently purchased an EAD smart cable with the thought of simplifying my AC-3 setup (currently using a Sony da80es as a demodulator). Unfortunately I could not get the cable to work. Upon inspection, I noticed there is an LED and power adapter plug on the side of the demodulator box on the cable. Does anyone know what the voltage and amperage of the cable power adapter is? I have a universal adapter that has the correct size plug. All that is needed is what the specs are, but don’t want to accidentally damage the cable guessing. I have contacted the seller to see if he had a power adapter or if he knows what the specs are. However, If anyone has information or the cable and can check for me, I would greatly appreciate it. My google searches have come to naught regarding information on the cable other than confirmation that it exists. Post subject: Re: EAD smart cable power requirements? I've never seen one, would you care to post some pics? Yes, I certainly will post some pictures soon. It is a pretty compact unit compared to any demodulator I have ever seen, so I hope I can get it to work. As an update, the seller didn’t have any information as that were selling on behalf of the owner but is unable to contact them. If I can’t get it to work, they will provide a full refund if I return the cable. I put out some information requests to Noble Electronics and MIT cable. Although EAD is now defunct, Noble is the factory repair center for EAD and is run by a former EAD employee. They may have information on the cable. MIT is likely the actual manufacturer of the cable for EAD and is still in business. Hopefully one of them will have some information for me. My inquiries paid off. After contacting Greg Palma at Noble Electronics (EAD Authorized Repair Center), he was able to provide the information. 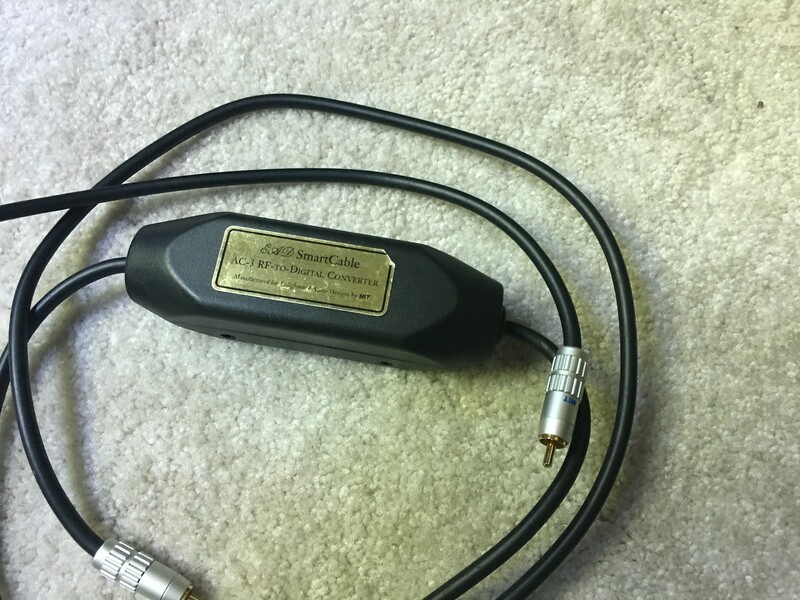 The cable takes a 9V DC, 5.5mm x 2.1mm barrel connector with a + center pin. I happen to have this adapter, and was able to get my cable to work perfectly. The LED lights up green with a positive AC-3 lock. Although it isn't labeled, the decoder only works in one direction, which isn't surprising. You need to orient the module as though you were reading the label on the box. The left hand side is the AC-3 RF input, and the right is a demodulated coaxial output. As requested, below is a picture of the cable. In case you are wondering about the size, the box portion is 2 x 2 x 5.5 inches (5 x 5 x 14 cm), so a pretty compact unit.